There are dark tides running through the universe — so strong they swallow light and threaten Captain Cornelius’s familiar existence; if unchecked they will absorb the whole of Creation. But for now he tacks into the solar winds, continuing his long search for someone to guarantee his life, his ship’s life and the life of the universe he loves. He sails in from the Rim, still searching. Nearly 60 years ago, Michael Moorcock burst onto the literary scene. Sixteen years old, he got his first taste of editing as he helmed Tarzan Adventures, guiding the British magazine and writing his first stories for it. In some ways a throwback to the pulp writing common to the magazines of the Golden Age of Science Fiction, Moorcock’s early work ranged from sword-and-sorcery fantasy to far future science fiction, and the characters that his name would become synonymous with, among them the albino Elric of Melniboné, saw their origins in that early work. In the 1960s, he was at the forefront of science fiction’s New Wave movement, overseeing the ground-breaking magazine New Worlds, and the pulp cliches that had typified science fiction gave way to literary conventions, and the genre became respected as a force of literature. In the decades that followed, his writings ranged from sword-and-sorcery with the Elric books, especially Stormbringer; historical fantasy such as Gloriana; religious explorations like Behold the Man; or literary fiction like Mother London. This autumn, Moorcock explores a new world — that of the BBC’s hit television series Doctor Who — with his new novel, Doctor Who: The Coming of the Terraphiles. Over his long career, Moorcock has won numerous awards, including the Guardian Fiction Prize for The Condition of Muzak, and his novel Mother London was shortlisted for the Whitbread Prize. For his body of work as a whole, he was awarded the Grand Master Award from the Science Fiction and Fantasy Writers of America, as well as the Bram Stoker Lifetime Achievement Award, and in 2008 he was named as one of the “50 greatest British writers since 1945” by the London Times. The eleventh Doctor and Amy Pond, currently seen in the all-new episodes airing on BBC America on Saturday nights, are drawn into perhaps the greatest adventure the last of the Time Lords has ever faced — the search for the nigh-mythical Arrow of Law. In distant space, the planet Miggea rests on the edge of reality, the cusp between this universe and the next. This planet, where space-time has worn thin and faces collapse, is the site for the grand finals of the competition to win the fabled Arrow of Law. The forces of Law and Chaos have long been at war in Michael Moorcock’s work, and throughout the Multiverse champions have chosen their sides. The Doctor and Amy are drawn into this eternal conflict, joining forces with the Terraphiles, a group obsessed with Earth’s history, who are determined to win the Arrow. But the journey to Miggea is fraught with peril — reality is fracturing, starships vanish in the night, and the space pirates commanded by Captain Cornelius prey upon the weak. The Doctor’s quest will not be an easy one, for there are some who will cheat, some who will betray, and some who will kill to achieve their aims — and all the while the universe itself stands upon the precipice of collapse. Doctor Who: The Coming of the Terraphiles represents a departure for Doctor Who literature from BBC Books. 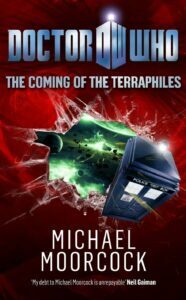 Written by an award-winning, world-renowned author, The Coming of the Terraphiles will appeal both to Moorcock’s many fans, who have followed him through stories of Elric or Jerry Cornelius, and to the many adult fans of Doctor Who, who have grown up with the series for ten, twenty, even thirty years or more. Arriving in stores this fall, after the fifth season Doctor Who finale “The Big Bang” and as fans await the upcoming 2010 Doctor Who Christmas Special, Doctor Who: The Coming of the Terraphiles will represent a true Doctor Who event — the first deluxe hardcover Doctor Who novel, written by a giant of literary science fiction, that brings together one of the world’s most famous television series – Doctor Who – with one of science-fiction and fantasy literature’s most popular milieus – Michael Moorcock’s Multiverse. This is truly a Doctor Who event 45 years in the making, and whether your customers are fans of Doctor Who or fans of the literature of the fantastic, Doctor Who: The Coming of the Terraphiles is one book they will not want to miss.